The mulberry tree is one that has been long forgotten. If you speak to younger people about mulberries, most of them probably have never even heard of them. The mulberry tree has a very long life span, ranging from 500 to 1000 years. Just imagine the benefits you can get from fruits that come from an almost ‘immortal’ tree. And there are about 16-17 species of mulberry, the following three being the reference point for the species: Morus nigra, usually referred to as the black mulberry tree, Morus rubra, also known as the red mulberry tree and Morus alba, or the white mulberry tree. The black mulberry tree (Morus nigra) produces significantly more fruits compared to the other two species of mulberry, but a rich soil and sufficient rainfall can make any tree of the species a heavy bearer of fruit. Its fruits are honey sweet and juicy. Truthfully, once you have tasted them, you might consider choosing black mulberries over strawberries or any other berries. I know I do. When ripe, some white mulberries can turn partly pink. Nevertheless, they are succulent, flavorful and mildly sweet. What do mulberries look like? Mulberries look a lot like other berries, except you find them growing on tree branches. On average, mulberry fruits are 2-5 cm long, but some species like the Pakistan red mulberry or Himalayan mulberry are known to produce 3 inch long fruit (7.6 cm). Usually, fruit have an elongated shape, but a rich soil and plenty of rainfall can make them quite plump, almost round-looking and juicy. Mulberries are compound fruit, meaning each fruit is actually made up of several others. As for their color, the unripe fruit are often a light green, but in some species they may be either white or a pale yellow. Ripe mulberries are white, pink, red-purple, dark purple, almost black. Just as interesting, the white mulberry tree has cultivars that produce white, red and purple-black fruits, so it is not always useful to identify mulberry species by fruit color. What do mulberries taste like? The taste of mulberries is highly dependent on soil quality, amount of rainfall and sunshine the tree receives. Under ideal conditions, white mulberries should be juicy and mildly sweet, but not necessarily flavorful. Red and black mulberries should be succulent and extremely sweet-tasting with various fruity flavors. Red mulberries that are not yet fully ripe may have a slight tart flavor, but it fades as they reach their optimal level of ripeness. Black mulberries have a sticky, honey-sweet taste with complex fruity flavors and a pleasant, but mild tartness to them. The white fruit ripen first in late spring-early summer, followed by red ones. Black mulberries ripen last, in mid to late summer. Both red and black fruit stain clothes, as well as fingertips for up to several days. 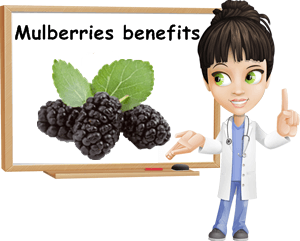 What are the properties and health benefits of mulberries? Eating mulberry fruits contributes to higher energy levels as a result of their generous B vitamin content and helps fight anemia thanks to a high iron content. They also contain good amounts of vitamin C to boost iron absorption and stimulate the immune system. Other nutrients in mulberries have strong antioxidant and anti-aging properties, cardiovascular benefits, contribute to better bone density, blood coagulation and have benefits for skin and hair. Fruits are a good source of vitamins and minerals and their pinkish-dark red pigmentation suggests they contain high levels of flavonoids called anthocyanins. There are studies that suggest that eating dark-red fruit like mulberries can protect against diabetes, bacterial infections, neurological diseases and even some forms of cancer. In addition to this, red and black mulberries rich in anthocyanins are said to have the potential to reduce inflammation and slow the aging process. Mulberries contain resveratrol, a natural antioxidant, anti-mutagen and anti-inflammatory that can also be found in red wine. Resveratrol, which is a polyphenol flavonoid, is said to help prevent strokes by modifying the molecular mechanisms within the blood vessels. It reduces vascular damage by lowering the angiotensin hormone responsible for vasoconstriction and high blood pressure and increasing the levels of nitric oxide, which is a vasodilator hormone. In other words, eating mulberries can help lower blood pressure, offering cardiovascular benefits. 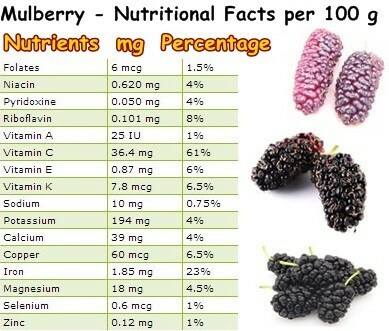 Mulberries are especially rich in vitamin C, as you can see in the nutrition table below. 100 g of fresh mulberries has 36.4 mg of vitamin C, providing about half of your minimum recommended daily intake of the nutrient. Eating foods rich in vitamin C means your body will be better equipped to fight off infections. Moreover, it will be more efficient in reducing inflammation and better prepared to prevent and reverse free radical damage to cells. Mulberries contain small amounts of vitamin E for healthy skin, but have almost no vitamin A: less than 1% of the RDI for an average adult. They are also a good source of vitamins B1, B2, B3, B6 and B9 (thiamine, riboflavin, niacin, B6 and folic acid) which help the body synthesize carbohydrates, proteins and fats from food to provide energy and combat fatigue. B vitamins are vital for brain and nervous system health and eating mulberries can help enhance memory and combat foggy thinking and mental fatigue. They contain small amounts of vitamin K: 7.8 mcg per 100 g of fresh mulberry fruit. Vitamin K supports blood coagulation, helps prevent bleeding from nosebleeds and easy bruising as well as exerts a strong anti-inflammatory action. Last but not least, mulberries are a good source of minerals such as calcium, potassium, magnesium, copper and iron. Calcium and magnesium contribute to better bone density. Magnesium further helps calm agitation and is good for the heart and other muscles. Potassium is an electrolyte which helps keep the cells of the body hydrated and lowers high blood pressure by counteracting the effects of a high sodium intake. Copper helps preserve hair and eyes pigment. Lastly, 100 g of mulberries contains 1.85 mg of iron, which is about 10% of the recommended daily intake for an average person, based on the 2016 updated Reference Daily Intakes of nutrients from food. The type of iron in mulberries is non-heme and is different from the iron in meat and fish. Fortunately, the vitamin C in the fruit helps ensure a maximum absorption level, making mulberries a good choice for preventing and reversing anemia. Mulberries also contain small quantities of lutein, zeaxanthin, beta-carotene and alpha-carotene, which play a crucial role in the fight against the infamous free radicals and promote good eyesight. When do mulberries fruit and ripen? Mulberries, these wonderfully juicy and sweet fruits, can be found roughly from May till late August. Where I live, white mulberries ripen first, usually in mid-late spring (May- early June), while red mulberries ripen in early-mid summer (June-July). Black mulberries ripen last, usually starting in mid July till late August. Fruiting starts roughly one month-one month and a half before ripening, two or more months in the case of black mulberries. However, different regions may see different fruiting and ripening patterns. Though they are scarce in markets, mulberries can easily be found in nature, in people’s yards, even parks. They are easy to recognize: delicious looking, tender, small fruits ranging from white-pink to dark-red and purple-black, hanging lightly from the branches of a mighty, centennial tree. They’ll certainly make your taste buds want more. And here’s something you might find interesting: did you know that there are mulberry trees that never produce any fruit? These are the male counterpart of the female mulberry tree and are a prolific source of allergenic pollen in spring.